She expertly takes the tip of her munthani forward, walks to her plants and smiles for the camera. There is bindi on her forehead and sindoor where her hair parts. Jennifer Kumar can, after a year of settling in Kochi, effortlessly merge into a crowd of Malayali women. Her Indian connection started years ago when as a college student, Jennifer tripped down from upstate New York to the Madras Christian College for her Masters degree. 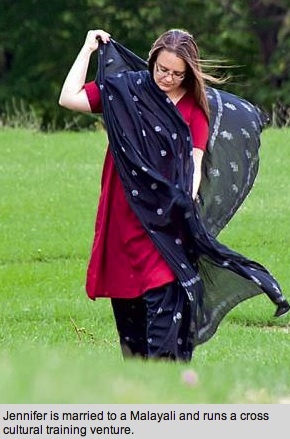 After returning to the US, she became involved with many Indian groups. And that is how she met her husband, a Malayali. “We were living in the US, and he was offered a position in Kochi, and we decided to move last year,” she says. Jennifer is an entrepreneur in Kochi, offering training in cross cultural preparation, spoken English, soft skills and personality development. "I call my venture Authentic Journeys." She fell in love with the climate of Kerala and the fact that being a vegetarian was easier here. “I like Indian food and I do cook it regularly. I enjoy food from Tamil Nadu, north Indian food and some special Kerala dishes. She adds, “One other thing I like about Kerala is that, on the whole, people are more aware of the world than in other parts of India (and elsewhere). I also like the fact that every other family has someone abroad, and may have travelled abroad themselves. She has observed people complain that the ‘bad stuff’ comes from the West. "In my opinion the beauty and mystery of some parts of Indian and Kerala culture have been lost in exchange for some modern things. As a cross-cultural coach, I really do understand that this is a delicate balance. For example, I recently learnt that people in the village use parts of the palm tree as a baby's bathtub. Now-a-days most people buy plastic baby tubs which are not good for the environment, whereas these palm tree tubs are eco-friendly and biodegradable!" Thank you for writing such nice words about me, and allowing me to republish this here, Cris. See the original article, published in 2012 as a PDF here. See how the article looked in the newspaper!